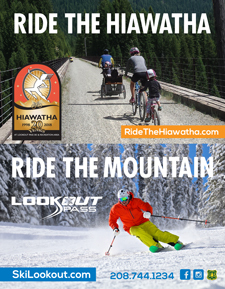 Looking for an adrenaline rush while in North Idaho? Try strapping into a harness and soaring through the air, hundreds of feet above the ground! There are currently two zip line operations in the Idaho Panhandle to get your heart pumping. Silver Streak Zipline Tours in Wallace starts their season in late spring. They offer two zip courses: the West Course which has six zips from 425′ to 1,100′ and the East Course with four zips from 325’ to 1800’. Each course takes approximately 2 1/2 hours to complete. 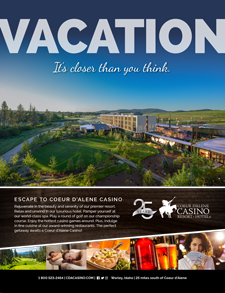 Book your zip lining tour through Coeur d’Alene Adventures for discounts on adventure packages. Schweitzer Mountain has over 700′ of zip line that takes you from the Village toward Lake Pend Oreille ending up at the Musical Carpet. The also have a dual zip line which allows two people to go down side-by-side. They are open late June through Labor Day. FYINorthIdaho.com is a proud member of the Coeur d'Alene Chamber of Commerce, Post Falls Chamber of Commerce, Historic Silver Valley Chamber of Commerce, North Idaho Tourism Alliance, North Idaho Building Contractors Association, Sandpoint Chamber of Commerce and has operated the premier portal to North Idaho websites, events and activities for more than 25 years. Copyright 2019 by FYINorthIdaho.com, Inc. and Novel Enterprises, LLC. All Rights Reserved. FYINorthIdaho.com does not guarantee the accuracy of rates or information listed on this website and assumes no responsibility for errors, changes or omissions. Information is supplied directly by individual advertisers and contributors and is not intended to constitute an endorsement or recommendation by FYINorthIdaho.com or the organizations which distribute it.